The story is written in the first person. Although it is factual and autobiographical it only covers a portion of the author’s life, beginning with a two year stay in Saudi Arabia as an advisor to Saudi Telecom. At the end of a vacation in Kashmir, John’s Indian Airlines flight is hijacked to Lahore in Northern Pakistan. After leaving Saudi Arabia the author’s world tour is cut short when he lands in a hospital in Norway with a spinal meningitis-induced coma. Waking from the coma just long enough to prevent a potentially lethal injection of penicillin (to which he is allergic) leaves John with questions about the nature of existence. This changes his trip into a journey of discovery that spans two and a half years and every habitable continent save South America. A remarkable, almost unbelievable, chain of coincidences leads the way and shows the author when he’s on the right track. Travels initially range through South East Asia, Australia and New Zealand. Meetings with remarkable individuals ensue, including Mark, the ex-advertising executive from America, who gave it all away to plant trees in the Australian hinterlands. In Papua New Guinea the author is profoundly touched by the simple, harmonious way of living of the Trobriand Islanders. During a freighter trip up the Fly River, also in PNG, John begins to clarify his vision of creating a simple, self sufficient lifestyle. At the end of that river journey John sees the devastating environmental impact of one of the world’s largest gold mines, Ok Tedi. He then goes off the track to come face to face with some of the last people on the planet untouched by Western civilization. After a brief poignant interlude in the Philippines and a return to Canada to attend a wedding, the story resumes in China. Here John gets an appendicitis scare and encounters the insanely apathetic Chinese medical system. Strength of will propels him forward and upwards over the Khunjerab pass into fabled Hunza in Northern Pakistan. Deteriorating health and further coincidental meetings in Nepal and India propel John to seek the assistance of the great Tibetan healer, Dr. Yeshi Dhonden, in Dharmsala in northern India. It is also in Dharmsala, home of the Dalai Lama and a thriving Tibetan community, that the author experiences a profound spiritual awakening that leaves his life transformed and his purpose clear. At this time he meets Lucia, his future wife, and begins to receive a series of coincidental messages pointing him in the direction of Santa Fe, New Mexico. An eventful return to the Hunza takes on a surreal quality through an encounter with a ghost and beams of light projecting from the mountains. All told, eleven months are spent in the Himalayas before that undeniable chain of coincidences leads John through Africa to Europe for a reunion with Lucia before heading to New Mexico to meet his destiny at a unique property outside Santa Fe. Here, this story ends and the sequel, Turquoise Mountain: The Adventure Continues, begins. That book is being written now. 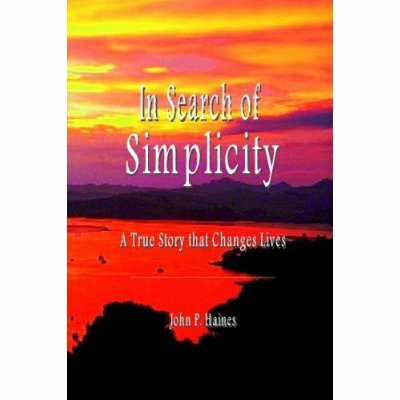 In Search of Simplicity is the extraordinary story of an ordinary man, told with a blend of humor, penetrating insight and adventure. The book is no mere travel saga. It is an adventure into the very heart of life that leaves every reader transformed. There is a message of ecological oneness and of the unity that exists at the core of all religions and beliefs. There is a message of hope and personal healing and finding one’s personal mission in life. And the story is all the more real because it is true and is tempered with sometimes humorous incidents and flashbacks to earlier times in the author’s life. Robert, thanks for your comment. Wishing you a wonder-filled holiday season and a 2009 that finds you always in the flow. Looking forward to hearing how you enjoy the read.